Receive up to BM$13 by attending this module. BM$ can be used to offset future course fee payments. Engage, experience, and be empowered by the energizing sounds of the electric guitar. Express your faith to God with fiery passion, the way you were meant to. 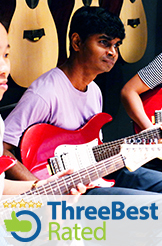 The Primer 3-week Accelerated module will equip your child with basic electric guitar playing aptitude applicable towards a wide spectrum of songs. With careful attention to the handling of this instrument’s potential, each student will have the right platform to advance to a greater playing responsibility. Thematic Devotion: Explore what made King David ‘a man after God’s heart’. • Lessons are 90 min. per week group sessions. Have been with BM since 2012. Never thought I could make this far from Acoustic Guitar to Electric Guitar with a crazy schedule as a full time working mum & a wrist ligament injury. Thanks to all the wonderful staff at BM for their care during my anxious & difficult time wondering if I could play guitar anymore. Special thanks to the customer service executives for their kind patience attending to my phone calls & counter queries (yes indeed I believe I was maddening :-P) Thank you for taking me higher every lesson. It is simply a wonderful experience to be at BM journeying with a team of committed coaches & staff. ii) Wish to relearn the fundamentals of playing guitar especially strumming feel or rhythm. This will help you to develop your playing further. iii) Already playing rhythm acoustic guitar and seeking to diversify to the electric guitar. We accept registrations from ages 8-16. We will channel students to classes of compatible age groups whenever possible. This step-by-step course is designed for total beginners who have absolutely no prior knowledge in music or the guitar. Individuals who attended other beginner courses but are still unable to play confidently and effectively are advised to join this Primer Module. What you are going to learn here is going to be fun, powerful and practical for your personal worship. Adopt a heart of worship right from the start. Do I have to bring my guitar around? Is it convenient? All Training Rooms are fully equipped with practice electric guitars. Our Training Centres are conveniently located at International Plaza - Flagship (beside Tanjong Pagar MRT station), One Commonwealth (beside Commonwealth MRT station), and Tampines Plaza (beside Tampines MRT station). How is the Electric guitar different from the Classical and Folk guitar? Classical and Folk guitars are able to produce sound from its own body, while the Electric guitar uses electro-magnetic pickups (transducers) that converts energy produced by the vibrating guitar strings into electrical impulses that is fed to an amplifier. The amplifier then magnifies these pulses many times before the loudspeaker transforms them back into sound waves. Because of the mechanics involved, the electric guitar is able to produce a variety of sounds that the classical and folk guitar is limited to. We make it possible for you to track whoever signs up for the course and even include a subsidy appropriation. Are you interested in equipping and mobilizing the cells under your care in regards to worship? Please contact us for an appointment. We'd like to share with you how this guitar program can mobilize your cell ministry members and raise the level of worship involvement.